Are you having pool problems in Ahwatukee, Arizona? If so, Brian’s Pool Care can help! We put together a list of the most common pool problems in Ahwatukee and solutions to fix your problem yourself or hire a professional pool repair company to do it for you. As summer has come, you are probably prepared to jump in the pool, right? Well, with that comes pool maintenance and many find it to be a daunting chore. Since most people are not professional chemists, it is recommended by pool experts that you ask them about any issues you’re having before taking action. You can easily take in water samples to your local pool store on a monthly basis to have it tested. If you’re still interested in taking a hands-on approach to see if you have what it takes, below are the more common pool problems in Ahwatukee and how to fix them. Algae in your pool water is the most common pool problem you will run into. It causes water to be green “green pool”, and in more extreme cases will have a green surface with swimmers exiting the pool like a swamp creature. 90% of algae growth occurs due to a low chlorine levels in the pool water or the pH balance if not correct. Use a pool shock treatment with three times the amount of suggested shock treatment. Combine this with algaecide and it will get rid of the algae. Call Brian’s Pool Care to receive professional green pool cleaning services. The pool appears to be filled with debris, and when examining the filter, it is packed with debris too. There is no reason to worry. This simply shows the filter is working properly, and the filter has been clogged due to a dirty pool. When clogged, simply remove the debris and perform usual filter maintenance. According to Brevik, filters and pumps should be chemically cleaned at least once a year to expand the functional life. Call Brian’s Pool Care to receive professional pool filter cleaning services. The pool filter does not appear to be turning on at all. No noise is coming from the pool filter. There aren’t any DIY solutions to replacing your broken filter unless you have pool equipment repair experience. Call Brian’s Pool Care to receive professional pool filter repair services. Pool appears to have a bunch of foam, with white suds appearing on the surface. The majority of foaming found in pools seem to occur due to a poor algaecide. When asking how to determine an algaecide is poor. They do not simply say they foam on the package, but they are often cheaper and sold in many major marketplaces. Go grab you some anti-foam agent from the store to eliminate the foam. In the future, purchase your algaecide at a pool dealer. Call Brian’s Pool Care to receive professional pool cleaning services. Pool water becomes a brilliant teal or a chocolate milk brown and blonde hair may become green. The root of the issue is a build-up of minerals, and a lot of them. If iron minerals build-up, it causes brown water, and copper build-up causes water to appear teal and turns hair green. Various chemicals are available at your local pool store to treat the issue. You will start by determining the type of mineral build-up, and grab the correct treatment. Call Brian’s Pool Care to receive professional pool maintenance services. When you are unable to see the pool bottom and it becomes a mystery as to what lurks beneath… The common reason is your pH levels are out of balance, and rain will only increase the problem. Rain is very acidic in the area, and it impacts the pool’s pH levels. You need to have the water tested to determine the pH level and adjust as needed. The pH level can be too high or too low. If the wall of the pool has a brown stain or on the floor, and you have no idea where it came from, sounds like you may have a stain. If may be organic, or if you had a mineral build-up, this could be the cause. You can test this by putting a little pH decreaser on a sock, then rubbing it directly on the stain. If the stain is removed, you are done. If the stain remains, try the method again using a chlorine stick in the stock, instead of pH decreaser. Call Brian’s Pool Care to receive professional pool tile cleaning services or pool acid washing services. Brian’s Pool Care offers solutions to any pool problem you may be experiencing in Ahwatukee, AZ. 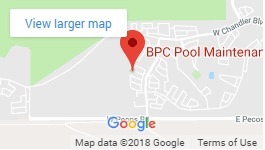 Give us a call today at 480-907-7959 for more information or to schedule pool services.